The Weekend Gourmet: Le Creuset Apple Cocotte Baker...Featuring Savory Apple-Italian Sausage Bread Pudding + a Le Creuset Stoneware Bowl Set Giveaway!! Le Creuset Apple Cocotte Baker...Featuring Savory Apple-Italian Sausage Bread Pudding + a Le Creuset Stoneware Bowl Set Giveaway!! If your Thanksgiving menu planning is in full swing, I've got a fabulous side dish recipe to share with you today! Le Creuset recently sent me a 2-quart Apple Cocotte baker. I wanted to come up with a perfect recipe to showcase its beauty. This apple-shaped baker features Le Creuset's signature enameled cast iron design, and it can go straight from the oven to the table for easy serving. It looks exacly like an apple -- right down to its stem-shaped handle -- making it a perfect serving piece for your Thanksgiving table! 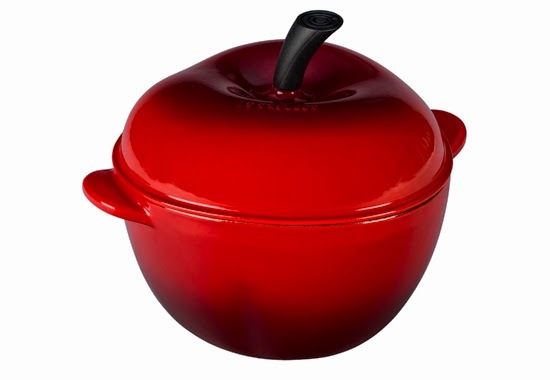 The apple cocotte can be used for making baked goods like casseroles or cobblers, but it also makes a great vessel for Fall soups. I found a savory bread pudding recipe designed specifically for cooking in the apple cocotte on the Le Creuset website. I did a little tweaking and created Savory Apple-Italian Sausage Bread Pudding. I substituted mild Italian sausage for the apple-chicken smoked sausage the original recipe called for. I also used half and half in place of heavy cream and left out the green bell pepper. I also added a bit of poultry seasoning and cinnamon to the mix for a holiday background flavor. Finally, since apple goes so well with cheddar, I added a cup of coarsely shredded sharp cheddar cheese! This bread pudding is savory, with a touch of tart sweetness from chopped apple. It pairs great with roasted chicken, making it a perfect Thanksgiving side dish! If you're looking for a something a bit different this year, I hope you'll give this savory bread pudding some consideration. Step 4: Butter the Le Creuset apple cocotte or a deep casserole dish. Ladle the bread pudding mixture into the cocotte. Cover and cook at 350 for 30 minutes. Remove the lid and cook an additional 30 minutes, until browned. Let cool 30 minutes before serving. This delicious savory bread pudding is a bit like traditional turkey dressing -- only richer thanks to the addition of the eggy custard. It's savory, with bursts of tangy sweetness from the apple...with a hint of sharp cheddar in every bite. The mild Italian sausage provides just enough spice to compliment the apple without overpowering. Although it's a perfect holiday side, it would also make a nice addition to weekend brunch tables year-round. Give it a try and let me know what you think! I served this savory bread pudding with oven-roasted chicken. To save time, do what I did: pick up a roasted chicken from the deli on the way home! Like the colorful enameled stoneware bowl/plate pictured above? Le Creuset is giving one of my readers a set of four of these versatile serving dishes!! They're meant to serve soup, but I also like to use them for casseroles and pasta. They come in a wide variety of gorgeous colors. The winner can select four bowls in one color, or do what I did: pick four complimentary colors to mix and match. To enter, follow the directions in the Rafflecopter below. I'll accept entries until Friday, November 21st; the winner will be notified by e-mail on Saturday, November 22nd. Good luck! Disclosure: Le Creuset provided me with an Apple Cocotte and a set of four soup bowls to facilitate this feature. All opinions expressed are solely my own.